The American Sanskrit Institute weekend immersions are fun and empowering, with no yoga experience required! PLEASE CONTACT ME TO TALK ABOUT SCHEDULING A WEEKEND IMMERSION AT YOUR STUDIO AS A FREESTANDING EVENT OR PART OF THE CURRICULUM FOR A YOGA TEACHER TRAINING PROGRAM. The first step in learning Sanskrit is to develop an intimacy with its sounds; become familiar with their exact location, feeling their force and power, and the unique way they vibrate the palate and engage the breath. 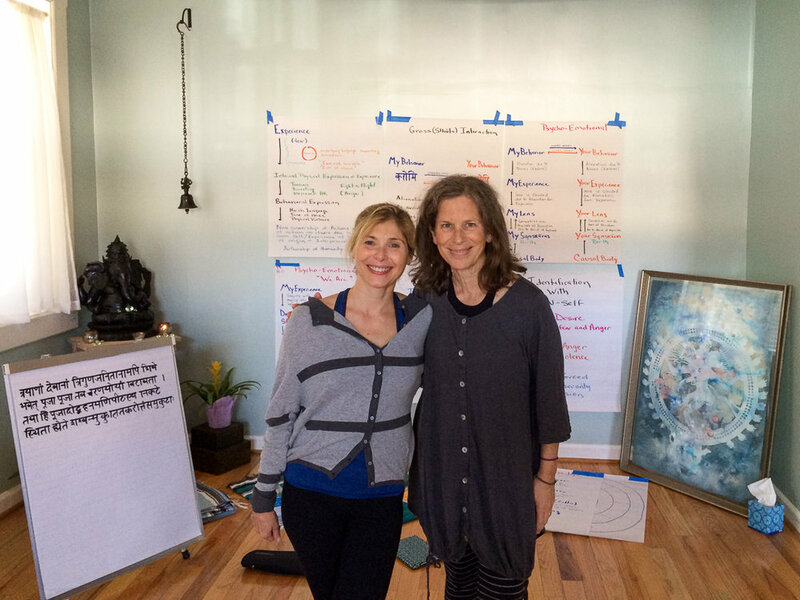 The 14 hour Sanskrit training is an educational adventure that will give you a permanent connection to the beauty and energy of Sanskrit as well as a dynamic model of yoga in the classroom that supports a natural and effortless focus. By the end of the weekend you'll be reading Sanskrit in its original Devanāgarīi script, learning how vowels are combined, savoring precise pronunciation and gaining access to the ancient wisdom of yoga encoded in this sacred language. A great next step for those who have taken Sanskrit Level I at any time. We will review the contents of Level I - the mouth positions, letters of the alphabet, and vowel combinations. Continuing to practice our learning model based on the yogic principles of abhyāsa and vairāgya, we will move on to study combined consonants and read more complex words as well as practice writing in the beautiful script of Sanskrit, Devanāgarī. You’ll receive the tools you need to continue exploration of your favorite sutras and chants. Intro to Sanskrit Level I is a prerequisite for this workshop. If you have questions and would like to join an existing or schedule your own Sanskrit Weekend Immersion, submit your inquiry using the form below. Click the button to learn more about the American Sanskrit Institute.